Most of the time you will be bored with your wallpaper. After changing the background your Android phone will give a better look. In this guide we will show you how to change lock screen wallpaper on cyanogen OS 12.1 ROM. There are lot of apps also available in the market which allows you to change the background or wallpaper of your Android phone. 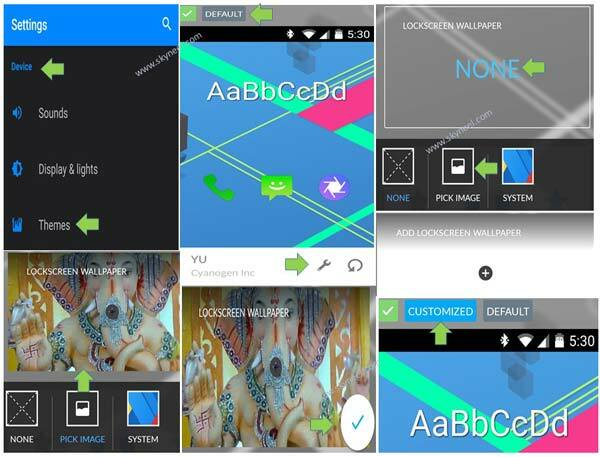 In this guide there is no need to install any app to change lock screen wallpaper on cyanogen OS. You just take few simple steps, after that your wallpaper is changed when your Android phone is locked. When you unlock your Android phone it will again shows you another theme which is set on your device. All we have the Android phone but lot of person does not uses different options of his device. There are few simple and interesting things which gives wow effects on your Android phone. This guide is useful for all those Android phone users who like to change lock screen wallpaper on Cyanogen OS 12.1 ROM. You can also use same wallpaper for lock screen and home screen as per your need. There is no need to root your Android phone. You just follow few simple steps after that you will be able to easily change lock screen wallpaper on Cyanogen OS 12.1 ROM. If your Android pone is running on Cyanogen OS 12 or above ROM then you will be able to easily change lock screen wallpaper on Cyanogen OS 12.1 ROM. You just take few simple steps to start the process of change lock screen wallpaper on your Android phone. Step 1: Tap on the “Settings” option on your Android phone which is running on Cyanogen OS. Step 2: Locate the “Device” category in the “Settings” dialogue box and tap on the “Themes” option. Step 3: Tap on the “Settings” tool. Tap on the “Add Lockscreen Wallpaper” option. Step 4: To select any image for lockscreen wallpaper tap on the “Pick image“. Select any required image for change lock screen wallpaper on cyanogen OS. This interesting and useful guide is helpful for all those Android phone users who want to change lock screen wallpaper on Cyanogen OS 12.1 ROM. There is no need to root your phone or install any third party app on your Android phone. You just following few simple steps to quickly change lock screen wallpaper on your Android phone. If you have any suggestion regarding this article then write us in the comment box. Thanks to all.